In this July 13th over at Activist Post that Steve Quayle linked to on his website on Saturday, they reported that Facebook has recently 'purged' the pages of more than 80 different independent media outlets and other groups, groups which had more than 40 million Facebook followers combined. And while some claim that this 'purge' is in response to calls for Facebook to further police what some call 'fake news', as the Activist Post story points out, a huge percentage of pages being 'purged' were alternative HEALTH pages, pages to website's and groups that weren't the least bit 'political' but were geared towards helping Americans survive health problems WITHOUT the poisons created in labs by 'big pharma'. As Jake Passi, the founder of the website 'Collectively Conscious', as well as one of the victims of 'the Facebook purge' had to say, "this is a crime against humanity”. 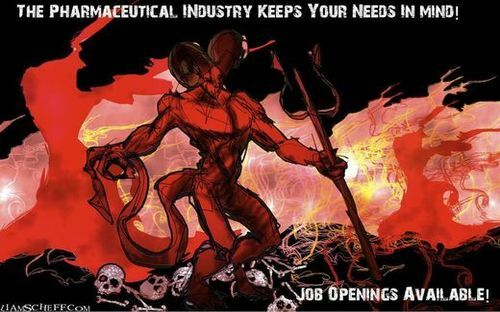 Passi called this purge a "deleting rampage" and it's just the latest proof that we've gotten that the 'big pharma mafia' has gone on an all-out war against the human race. With even President Trump recently calling them out on Twitter for continuing to raise the prices upon prescription drugs (YES! POISONS! 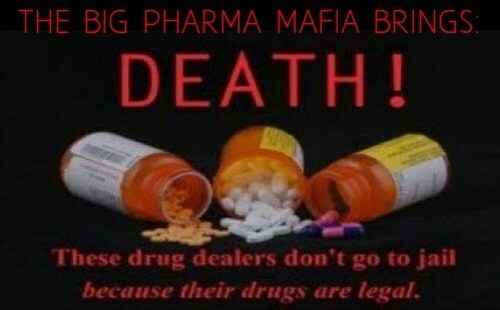 ), is the 'big pharma mafia' now striking back? And with this 'purge' of popular alternative health Facebook pages coming at the same time as a still expanding list of mysteriously dead holistic doctors and other natural health care practitioners, we find that it's probably not just a coincidence that this 'purge' of alternative health web pages from Facebook began in June of 2018, the same month that the merger made in hell between Bayer and Monsanto was completed. With the merger between Monsanto and Bayer creating the world's largest agrochemical company and the largest holder and supplier of seeds and pesticides in the world (despite Bayer selling its seeds division to BASF SE), we have to ask: "What happens when a company with ties to Adolf Hitler and Nazi Germany's extermination of millions merges with a company long known as the most evil corporation in the world?" “Bayer will remain the company name. Monsanto will no longer be a company name. The acquired products will retain their brand names and become part of the Bayer portfolio,” Reuters reported. Fortune pointed out that name-changes during acquisitions are unusual, especially when a company is very recognizable. But as one of the world’s most hated companies, losing the Monsanto name was expected as it was probably Bayer’s best way forward. Monsanto’s historical line-up of products includes banned and highly toxic chemicals such as 2,4,5-trichlorophenoxyacetic acid (a dioxin-containing component of the defoliant Agent Orange); PCBs (polychlorinated biphenyl); and Lasso (RoundUp), a herbicide banned in Europe. Glyphosate, the main ingredient in Monsanto’s best-selling weedkiller RoundUp, is the most widely used pesticide in the world and likely the most controversial. Monsanto is also the largest maker of genetically modified (GMO) seeds, giving them major hand control of the world food supply. Monsanto, the largest, but not the only, maker of genetically modified seeds, has borne the brunt of environmentalists’ opposition to the technology. The US seed maker has also been criticized for pursuing its intellectual property rights with farmers, many of which depend on its seeds. Activists have also condemned the company’s pursuit of lawsuits against small farmers to protect its patents on seeds. And while Bayer was quite quick to dump the Monsanto name and for good reason, a look back at their long history and ties to the Nazi Germany death and war machine of Adolf Hitler has given absolute proof to the world that Bayer was just as evil as Monsanto in their day with Bayer tied directly to Auschwitz, Germany death camps. Bayer’s new deal to buy Monsanto breaks records not only due to its size but because of its evil smell – and not only due to Monsanto’s reputation for deadly trails of everything from disappearing wild flowers and butterflies to poverty-stricken family farmers forced to buy its seeds and pesticides. Bayer, perhaps best known for its aspirins or other useful medicines, also has a trail marked with death, but in far, far greater numbers. It was Bayer, together with two other chemical giants, BASF and Hoechst, which developed the terrible chlorine gas used in World War I. In 1925, the three formed a giant cartel, IG Farben, which became the world’s leader in pharmaceuticals, dyes, and chemicals. During the early 1930s, IG Farben became the single largest donor to the election campaign of Adolf Hitler. Although it was slightly reluctant at first, because some of its key scientists were Jewish, in the decisive year before Hitler won power, IG Farben donated 400,000 marks to him and his Nazi party. This was amply rewarded. IG Farben, with Bayer, became the single largest profiteer of German conquests in World War II. While America is suffering through a deadly opioid crisis, the 'big pharma terrorist' drug pushers never do any jail time, quite similar to the corrupted deep state including James Comey, Peter Strzok, John Brennan, James Clapper, Hillary Clinton and Barack Obama never being held accountable for their crimes against the American people despite a laundry list of them including treason. According to this October of 2017 story over at the Washington Post , 'big pharma' actually funded terrorism in Iraq during the Bush and Obama years with a lawsuit filed by 108 US Veterans seeking to hold big pharma responsible for the deaths and injuries of US service members carried out by 'big pharma' funded 'death squads'. As Fierce Pharma also reported back in October of 2017, the "lawsuit alleges that top pharma companies Pfizer, Roche, Johnson & Johnson and AstraZeneca paid bribes to secure healthcare contracts in Iraq. Those payments ultimately supported terrorism that hurt or killed U.S. service members, the plaintiffs alleged." In a TIME magazine article a young man named Chad Colwell says "I got prescribed painkillers, Percocet and Oxycontin, and then it just kind of took off from there." According to TIME's reporting, "Prescriptions gave way to cheaper, stronger alternatives. Why scrounge for a $50 pill of Percocet when a tab of heroin can be had for $5?" About 75% of heroin addicts used prescription opioids before turning to heroin. 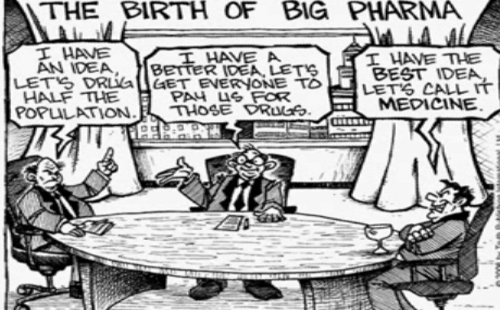 Any questions about Big Pharma's role in violence and death in America have been answered by the Centers for Disease Control and the American Journal of Public Health. 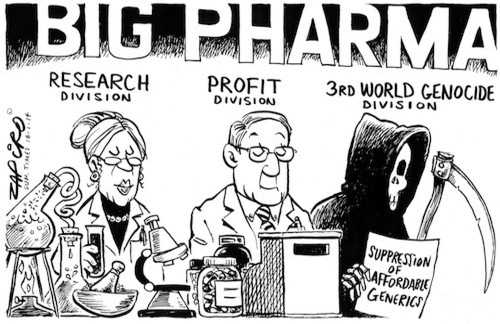 Any doubts about Big Pharma's intentions to intimidate the public have been put to rest by the many occasions of outrageous price gouging. And any uncertainty about political pressure is removed by its #1 lobbying ranking. As for malicious intentions, Bernie Sanders noted, "We know that pharmaceutical companies lied about the addictive impacts of opioids they manufactured." Purdue Pharma knew all about the devastating addictive effects of its painkiller Oxycontin, and even pleaded guilty in 2007 to misleading regulators, doctors, and patients about the drug’s risk. Now Purdue and other drug companies are facing a lawsuit for "deceptively marketing opioids" and ignoring the misuse of their drugs. No jail for the opioid pushers, though, just slap-on-the-wrist fines that can be made up with a few price increases. But partly as a result of Pharma-related violence, Americans are suffering "deaths of despair"— death by drugs, alcohol and suicide. Suicide is at its highest level in 30 years. According to this July 14th story over at The Express, scientists have recently made a huge breakthrough in their search for a deadly disease that could wipe out humanity, finding two new viruses that could lead to a 'disease X' outbreak. As their story reports, the 'Predict Project' has been scouring through the animal kingdom in an attempt to discover viruses "which could one day mutate and wipe out humanity". And while we think that preparation is great and everybody should be prepared for anything that might be coming, for scientists to be seeking out such a virus at a time when practically anybody can become a mad scientist with CRISPR technology reeks of insanity. And knowing the history of corporations such as Bayer and Monsanto and their merging of two evils should be enough to concerned with mega-corporations that have proven they could care less about human life combining into one large entity that has its hands in not only the food that we eat but the water we drink and the air we breath, just imagine the dark new drugs they might create to kill off humanity, brewed in their cauldrons of hell. As Steve Quayle tells us, through that tampering with our water, food supply and air, what they're doing is a form of pre-extermination, "if they can't kill all who were created in God's image and likeness, they'll genetically modify the original genetic blueprint out of existence". 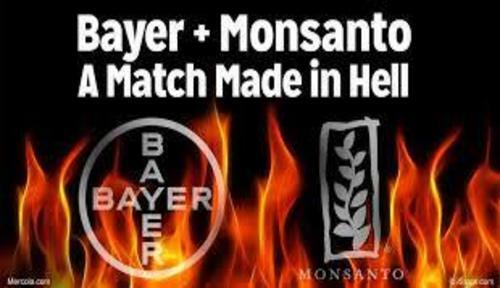 Once again, a look at 'Today's Bayer' from this People's World story proves that even the Bayer-Monsanto merger can't erase Bayer's Nazi chemists pasts nor the evil stench that comes into the air whenever the word 'Monsanto' is mentioned. Those wartime IG Farben men are all dead, but their companies flourish. And Bayer has been accused in recent years of unethical medical experiments, selling drugs shown to be risky, hindering developing countries from developing vital medications, and using imported materials produced by child labour. The most serious charge, perhaps, is that a Bayer subsidiary, H.C. Starck, was partly responsible for the long, bloody civil war in the Democratic Republic of Congo, which involved the winning of various minerals but above all the valuable coltran, of which it is the main producer. Until now, sibling BASF was the largest chemical firm in the world. If the deal holds, it will now be overtaken by Bayer-Monsanto. Any hopes that Bayer will somehow be bettered in its ways under the influence of Monsanto seem at the least unrealistic. Does Facebook's purge of alternative health pages beginning in June of 2018 have anything at all to do with the merger of Monsanto and Bayer, also finalized in June of 2018? With natural health practitioners apparently being knocked off and 'big tech' launching an all-out war upon natural health, it's quite easy to see the globalists satanic agenda if we look closely enough and evidence shows, it doesn't include you and me.